or (760) 727-5857, or visit our CONTACT page for email and more details. 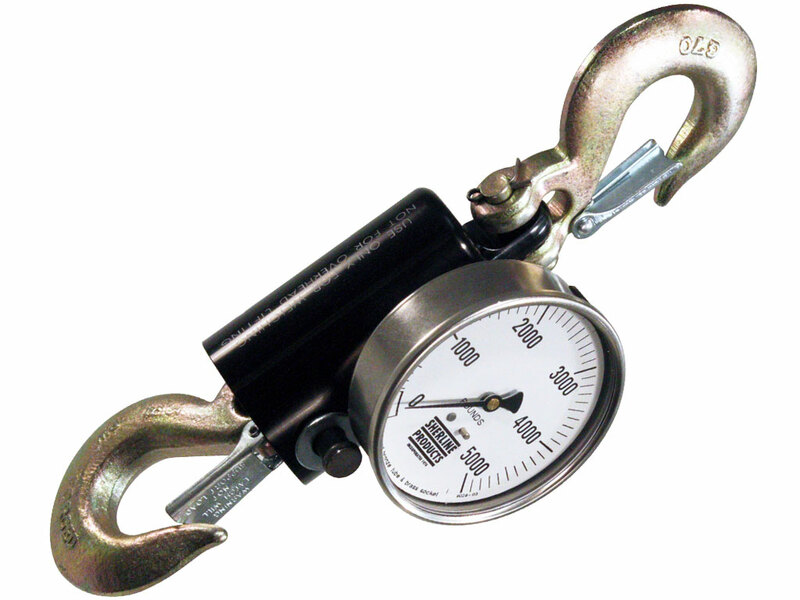 Hanging scales make it easy to measure weights up to 5000 lb within 2% accuracy. Sherline's suspended hydraulic scale is a handy item to have around any machine shop or factory. Available in gauge ranges of either 0-2000 lb or 0-5000 lb, the scale provides an economical way to confirm the weight of heavy items being placed on a truck. We also use it in our plant to check the approximate weight of barrels of coolant-soaked chips going our for hazardous waste disposal to make sure we are not being overcharged. Other industries have found many more uses for the scale. For example, the utility companies use it for checking the weight of power poles before lifting with a helicopter. The tobacco industry pays farmers a premium for bales of tobacco delivered within a certain weight range. More uses are being found all the time for this inexpensive scale. Manufacturing companies use them to lift rolls of partially used paper, wire or foil to see about how much material is left. Find out if your trailer is properly loaded BEFORE you have an accident! 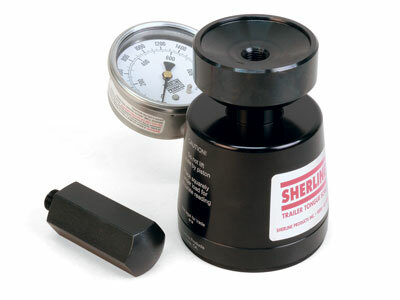 Sherline's Trailer Tongue Weight Scale is designed to confirm the tongue weight of cargo or RV trailers before hauling. Proper tongue weight is essential for safe handling on the highway. It should be 10% to 15% of the total trailer weight. Too much weight on the tongue and you can damage the hitch or trailer tongue, while too little weight on the hitch can cause dangerous or even fatal trailer fishtailing. Measuring tongue weight directly at the hitch ball receiver or jack stand is the only way to be sure you are loaded properly. This compact scale has also been speced into many interesting industrial uses, such as measuring the roller pressure in the printing presses of the Washington Post newspaper. Change from a 5C collet setup to a 3- or 4-jaw chuck in seconds. 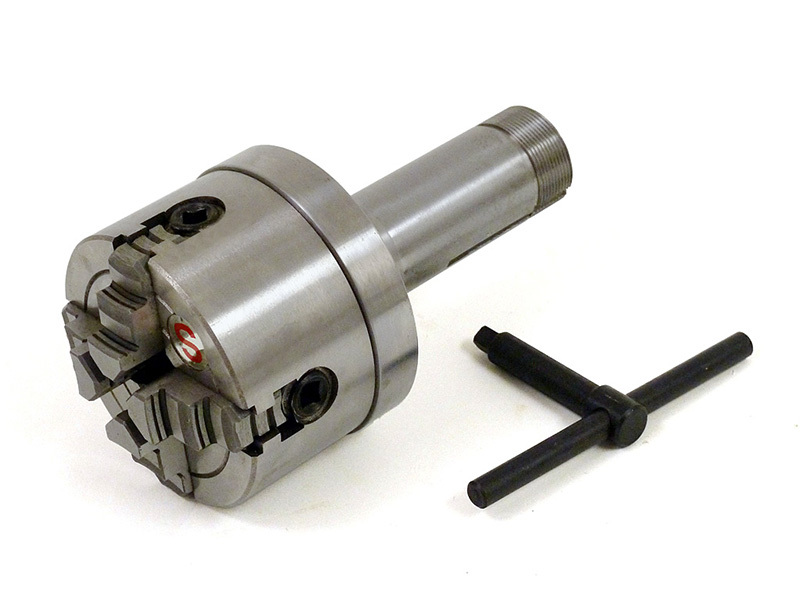 Switch from a 5C collet to the accuracy of a 4-jaw or the convenience of a 3-jaw chuck with these quick-change chucks. The machined steel backs fit in a standard 5C collet holder. Enjoy great prices on the last of the chucks we have in stock before they are all gone.